On February 17, 2009 Obama signed a $787 Billion Dollar the American Recovery and Reinvestment Act, a stimulus package. The ARRA was packed with billions of dollars dedicated to Green Energy. 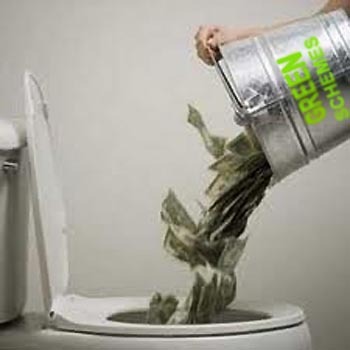 If you really want to have your eyes glaze over at the staggering sum of monies spent by Steven Chu, King Pin of the Department of Energy, on this Administrations Green Agenda, take a look at this project spread sheet from the Department of Energy's site. 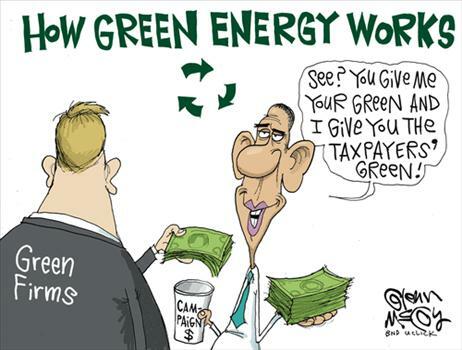 On September 6th, Solyndra which received $535 million, in a loan that was restructured last January, which placed tax payers last filed for Bankruptcy. One of the owners, Kaiser, was a campaign bundler and major contributor to the Obama election in 2008. "..."Solyndra's downfall puts a spot light on the kind of taxpayer-funded cronyism this White House said it would eliminate," said Republican National Committee Chairman Reince Priebus in a statement. 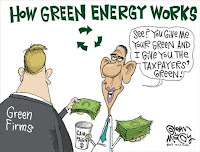 "After bundling tens of thousands of dollars for President Obama and his campaign, company officials were granted at least 20 visits to the White House and had Energy Department officials sitting in on company board meetings. Before taxpayers are forced to spend another dime of stimulus money, the White House must explain why they were so reckless the first time around." House Republicans also say they have e-mails showing the White House pressuring Department of Energy professionals to expedite the loan approvals, although the White House has argued that nothing improper happened..."
On September 28, 2011 the Department of Energy announced a $737 million dollar loan guarantee to Tonopah Solar Energy, LLC to develop the Crescent Dunes Solar Energy Project. ..."One deal, a $737 million loan guarantee for Solar Reserve LLC, paves the way for construction of the 110-megawatt Crescent Dunes Solar Energy facility, which will use an array of mirrors to focus the sun's heat and power a steam generator. The Crescent Moon project will create 600 construction jobs assembling and mounting solar panels during the projected 30 month construction time frame, and 45 permanent operation positions once opened and licensed for operation, at an outrageous cost of $1,142,635 per job. From this document released by the Department of Interior, led by Ken Salazar, states the goal is to: "...Provide an $850 million investment in U.S. renewable energy infrastructure, aided by American Recovery and Reinvestment Act-supported loan guarantees and renewable energy investment tax credits." This release goes on to state, "... ANOTHER RECOVERY ACT LEGACY: The American Recovery and Reinvestment Act (ARRA) has served as an opportunity to transform the way we use energy, reducing our carbon emissions and create entire new industries based on American resources, ingenuity, and workers. Through the ARRA payments in lieu of tax credits for specified energy program, Tonopah Solar Energy can apply for payments of up to 30% of the eligible costs of the project. These payments are authorized by Section 1603 of the ARRA tax title." Some of the smarmy smelly details surfacing in the $737 million dollar deal to Tonapah, according to The Gateway Pundit: "It’s as if Solyndra never happened. The Obama Administration is giving $737 million to a Tonopah Solar, a subsidiary of California-based SolarReserve. PCG is an investment partner with SolarReserve. Nancy Pelosi’s brother-in-law happens to be the number two man at PCG..."
Also troubling is one of the Principles from Solyndra, George Kaiser a campaign funding bundler, is also invested in this project. Kaiser has been reported to have made multiple visits to Whitehouse, prior to Solyndra receiving the $535 million dollar loan. In this You Tube, from July of 2009, Kaiser stated "there has never been more money shoved out of the Government's door," while bragging about leveraging his White House connections in order to gain Stimulus funds. If Kaiser has the following Forbes rankings, #31 Forbes 400, #89 Forbes Billionaires and #32 in United States, it begs the question if Solyndra was such a sound fiscal idea, why did he not personally participate through a venture capital group? According to this document heralding the announcement, here is an explanation of how this new technology works, "...SolarReserve’s solar power tower technology generates power from sunlight by focusing the sun’s thermal energy utilizing thousands of sun-tracking mirrors (called heliostats) onto a central receiver. A salt compound, heated to its liquid state, is circulated through the receiver to collect and store that energy. The heated salt then flows to an insulated storage tank, where it is stored for use during times when direct sunlight is unavailable, allowing for 24-hour-a-day power availability. When electricity is needed, the hot salt is sent to a heat exchanger to produce steam, which in turn drives a conventional steam turbine electrical generator. The cooler molten salt is stored, ready to be reheated by the sun and used again as part of a continuous closed loop. The system is completely self-sustaining and emissions free – no fossil fuels are required." The second deal, a $337 million dollar loan guarantee awarded on Thursday September, 28, 2011, to Sempra Energy, California’s third- largest utility, received a $337 million U.S. Energy Department loan guarantee to build a 150-megawatt solar project in Arizona. While the project boast the solar panels will be manufactured in Arizona, the Suntech is a Chinese Solar Manufacturer. In this article from Bloomberg Business Week, "The Mesquite project in Maricopa County, about 45 miles (72 kilometers) west of Phoenix, will use 800,000 multicrystalline silicon solar panels from Wuxi, China-based Suntech Power Holdings Co., San Diego-based Sempra said in February." According to this article, from Seeking Alpha, It clearly shows Suntech operating in the red, "Suntech Power (STP) is posting earnings results this morning that are in line with its competitors. Strong revenues and plummeting profits. Even when you take out the write off for the MEMC (WFR) and CSG Solar investments, the company still lost .19/share despite strong revenues of $830 million. Analysts had expected a profit from the company on revenues of $800 million. The CEO acknowledged it remains a highly competitive market and that it should remain so for some time. "In a competitive market environment, our core operations performed well as customers continued to demonstrate their preference for Suntech’s superior quality and highly bankable solar products," said Dr. Shi, Suntech’s chairman and CEO. "With 48% shipment growth year-over-year, we achieved our shipment guidance and continued to improve our position in the Americas and emerging solar markets. Our pipeline to supply bankable utility-scale solar projects continued to build during the quarter, most notably with our 190MW partnership with Solarhybrid in Europe, and a recently-inked 200MW agreement for multiple projects in North America. We are also gaining traction in China’s utility solar market, which has been stimulated by the introduction of a national feed-in-tariff." Looking ahead, the company expects PV shipments to increase 15% sequentially but also expects a $30 million loss relating to hedging. For the full year, the company expects to ship at 2.2GW of solar products and generate revenue of $3.2 – $3.4 billion which is lower than the previous estimate for $3.3 – $3.5 billion. After initially rising at the open today, shares of STP have given up most of the gains and remain very weak technically. Sell volume continues to overshadow buy volume so it’s going to take some time before a definitive bottom can be called." Here is a capture of Suntech's performance , showing the stocks decline, and a review, "Sep 29, 2011 (SmarTrend(R) Spotlight via COMTEX) -- SmarTrend identified a Downtrend for Suntech Power Holdings (NYSE:STP - Analyst Report) on May 04, 2011 at $8.37. In approximately 5 months, Suntech Power Holdings has returned 70.1% as of today's recent price of $2.50. In the past 52 weeks, shares of Suntech Power Holdings have traded between a low of $2.49 and a high of $10.83 and are now at $2.50, which is 0% above that low price. Suntech Power Holdings is currently below its 50-day moving average of $5.28 and below its 200-day moving average of $7.74. Look for these moving averages to decline to confirm the company's downward momentum. In the last five trading sessions, the 50-day MA has fallen 5.05% while the 200-day MA has slid 1.09%. SmarTrend will continue to scan these moving averages and a number of other proprietary indicators for any changes in momentum for shares of Suntech Power Holdings." And there are more in the pipeline awaiting approval, but may miss the deadline for funds that were available in the American Recovery and Reinvestment Act, expire tonight at midnight, when the new fiscal year begins at 12:01 a.m. EST. Of the projects awaiting decisions from the DoE, SolarCity’s $344 million project to install rooftop solar panels on military base housing will not meet tomorrow’s deadline. Two more projects from First Solar remain in the running. Both the 230-megawatt Antelope Valley project, with a conditional guarantee of $680 million, and the 550-megawatt Desert Sunlight project, with a partial guarantee of $1.88 billion, are still in the running. Sunpower Corp. (NASDAQ: SPWRA) is seeking a guarantee of nearly $1.2 billion for its 250-megawatt California Valley Solar Ranch project. Perhaps the most interesting project remaining in play is Project Amp, a $2.6 billion project to finance solar installations on US commercial and industrial rooftops. The project is owned by ProLogis (NYSE: PLD), and is seeking a guarantee of up to 80% on $1.4 billion in debt financing that is being underwritten by Bank of America Corp. (NYSE: BAC). It’s also worth noting that tomorrow’s deadline for federal action applies only to so-called Section 1705 projects. Newer technologies like concentrating solar PV fall under Section 1703 of the law and will still be eligible for consideration." I do not recall great entreprenuer Thomas Edison seeking massive grants from the government to finance his dreams, As a matter of fact the Department of Energy did not exist when Edison was busy being an industrial genious. I believe in most circumstances communities and states place municipal place huge infrastructure electrical generation facilities on ballots seeking voter support, and are built as a result of voters accepting to certain taxes to pay for these beneficial improvements. If these sorts of huge reflective mirror like panels are truly the 'wave of energy' production in the future, (and their environmental impact on arid lands and deserts are yet to be fully understood) why should the Federal Government be engaged in forcing this type of energy production with either your or my tax dollars. I am entirely against the Federal Government acting as the venture capitalist guaranteeing these enormous sums of money, to 'nudge' Americans towards a favored energy model driven by envirofascist. The American Recovery and Reinvestment Act was the first piece of legislation shoved down the throats of American tax payers in January of 2009. This is unbelievable that such "crony capitalism" still may exists at the highest political level. Law obainding citizens are absolutely amazed with this type of behavior. It is called "Pay if you want to Play." Financial contributions to political campaigns should not be rewarded with support to multimillion dollars contracts using tax payers money back to donors and should be illegal. I'm beginning to wonder it the Dems witll have a candidate in 2012-- there's more stuff hitting the fan every day..
Melody, great job, I started wading through this early this morning.. didn't take long to figure out it would take hours to sort it out in my own head-- and many more to explain it to others. Don't know how long it took you, but I'd still be pulling out my hair. That makes twice you've made it to top on my website-- no other non member has made it once.